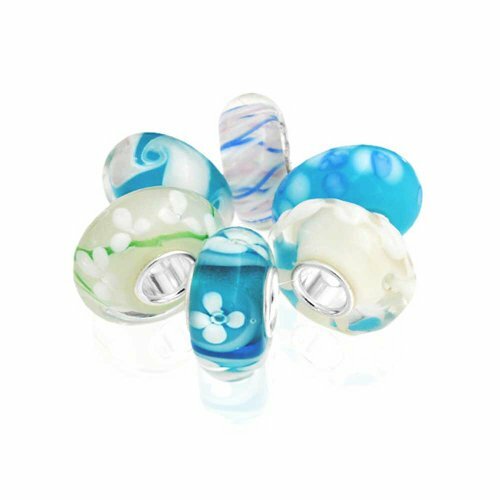 Set the tone for your beads bracelet with our simulated Aquamarine Murano glass lampwork bead set. With six stylish, classy, sterling silver charms in a colorful array of bright blues and white in floral and wavy patterns, our unique beads will make any sterling silver charm bracelet shine bright. Fits , and beads. From blue to white this set of six glass charms with 4mm unthreaded sterling silver cores covers many cool colors, in varying flat and 3D designs and even touches simulated aquamarine, the March birthstone.